Image: NASA acting Administrator Robert Lightfoot and Jean-Yves Le Gall, president of France's space agency CNES | June 19, 2017: NASA acting Administrator Robert Lightfoot and Jean-Yves Le Gall, president of France's space agency Centre National d'Etudes Spatiales, conclude the signing of a cooperative agreement with a handshake June 19, 2017, at the 52nd International Paris Air Show at Le Bourget. 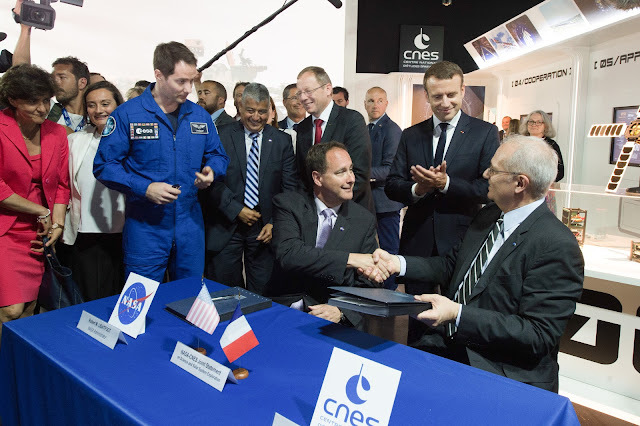 Astronaut Thomas Pesquet of ESA (European Space Agency) and French President Emmanuel Macron participated in the event to reaffirm the agencies’ desire to explore opportunities for collaboration to advance science and to enable robotic and human exploration of the solar system. France and the United States have a long history of cooperation in space, combining their talents over the years to advance science and launch exploration missions whose results have been instrumental in creating entirely new fields of research. The leaders of the two space agencies, Acting NASA Administrator Robert Lightfoot, and CNES President Jean-Yves Le Gall, reaffirmed the agencies’ mutual desire to explore opportunities for collaboration to advance science and to enable robotic and human exploration of the solar system during a meeting Monday, June 19, at the 52nd International Paris Air Show at Le Bourget. In particular, they discussed Mars exploration and Earth oceanography as well as the important work of International Space Station crew members, including French ESA Astronaut Thomas Pesquet, who returned to Earth earlier this month following his six-month mission on the orbiting laboratory. CNES is providing a critical instrument for InSight, the next Mars exploration mission that will study the planet’s deep interior. France is supplying the SEIS seismometer (Seismic Experiment for Interior Structures) that will measure tectonic activity on Mars to help probe its interior structure. During the meeting, Le Gall informed Lightfoot that SEIS will be delivered this summer, in readiness for mission launch in May 2018. He also indicated that the SuperCam instrument for the Mars 2020 rover mission will be delivered to NASA’s Jet Propulsion Laboratory (JPL) in the autumn of 2018 for integration with the rover. The agencies are also jointly developing a new space mission to make the first global survey of Earth's surface water, observe the fine details of the ocean's surface topography, and measure how water bodies change over time. The Surface Water and Ocean Topography (SWOT) mission is targeted for launch in 2021. The mission scientists are meeting later this month to plan science activities, and the radio frequency unit of the wide-swath radar interferometer, which will be capable of acquiring high-resolution elevation measurements of large bodies of water, has been delivered as planned to JPL. NASA and CNES have a shared interest in exploring opportunities for mutually beneficial cooperation in support of the robotic and human exploration of Mars. Both space agencies affirm the scientific and technical achievements made aboard the space station and its pivotal role in preparing for human expeditions beyond low-Earth orbit into deep space. A joint NASA-CNES physics mini-laboratory, the Device for the study of Critical Liquids and Crystallization, or DECLIC, is continuing to operate aboard the space station after its relaunch in October 2016 aboard the sixth Orbital ATK commercial resupply mission.